The Stage season 2 finalist Abhishek Gurung was one of those ever-smiling and shy natured guys (read polite) in the singing competition, but he would turn the table around with his killer performance when his chance came to rock the stage. His powerful voice, which has a style of his own, was praised by all the judges, and the road ahead seems to be bright for the passionate rock 'n' roll singer. Born and brought up in the beautiful town of Kurseong in Darjeeling, where locals strumming the guitar and singing along is embedded in their blood, Abhishek is a great example of the massive talent available in the region. Though Abhishek might not have emerged victorious, he has won the hearts of many, including the judges, with his personality and more importantly his singing, which helped him come so far in the competition. Abhishek, despite a busy schedule, agreed for an interview. Here is some excerpt from the interview. International Business Times, India (IBT): Congratulations for finishing in the top three of The Stage Season 2. How was the journey, competing against talented individuals? Abhishek Gurung: Hello and thank you. The journey was one hell of a ride, from start to finish. I feel lucky to have shared the stage with some amazing individuals. I learnt a lot from them. The competition was really tough as everyone had something unique and special to bring to the table and it was intense all throughout, but with the healthy environment, we are all very good friends and colleagues now. IBT: As you are a vocalist of your band, professionally, how did the members react when you informed them about giving it a crack in The Stage? Abhishek: They were cool about it. In fact, they encouraged me to come out all colours blazing. Both my bands (GingerFeet and StillWaters), were on a break at that time and I felt it was an opportune time give it a shot on The Stage. They had full faith in me and they still do (laughs). IBT: Coming to the finale, your take on Stairway to Heaven by Led Zeppelin led one of the judges labelling you as a legend as well. How much does such professional comments mean to you? Abhishek: I received some really encouraging comments, but that legend comment by Monica Dogra (judge) was the biggest compliment meted towards me in my musical career so far. It is huge and motivating, of course, but then it is challenging too. After having caught the attention of a much-larger TV base in India, I must maintain my standard and look for ways to even better that. I will work much more hard from now on to achieve greater things. IBT: One learned that you were suffering from high fever during the finale. Had you been in top health, could the final result have been any different? Abhishek: Yes, I had tested positive for dengue just before the finale, but that didn't matter. I had reached so far in the competition and there was no holding me back. I was singing an EPIC! I had to do justice to it. That was the only thing going through my mind then. In fact, it helped me feel the song on a much deeper level. I could emote well and especially during the last part, where the song builds up, I managed to vent out all my frustrations. I was not thinking about the competition while singing Stairway To Heaven. The song transported me back to my roots. RocknRoll! IBT: Sharvi Yadav won the award. She was consistent throughout the season. Besides the top three, who was your personal favourite and why? Abhishek: Well, all were amazing singers. Sharvi and Arunaja (other finalist) were phenomenal. They were just out of this world. They have such humongous voices and the best thing is that they have a signature style to themselves. And now coming back to the question, it is Aishwarya Suresh for me. She has such a beautiful voice that one will actually envy her vocal texture. I've heard her sing with just the Ukulele and it's so magical. Ehsaan Noorani, one of the judges of the show, said it right. She has a haunting voice and I can see her becoming a big star someday. IBT: The Stage is the only English singing talent show in India. Can similar contests lead Indian people more into western music? Abhishek: Yes, definitely. You can actually see it. The number of applicants this year was massive. It clearly goes to show that more and more people are drowning in this so called pool of western music and I'm confident that the third season of The Stage will be even more phenomenal. IBT: When did you initially take up signing? What inspired you? Abhishek: Well music has always been there in my family. As a kid, I used to imitate my aunt (who is a gospel singer) and while doing so, the foundation was laid subconsciously. I picked up the guitar in the 7th Standard and I actually discovered my singing capabilities in the 10th standard. I studied in Goethals Memorial School, Kurseong and during my final year, I took part in a singing competition and I emerged victorious. Then onwards, there was no looking back. IBT: Even during your days at Saint Joseph's School, Darjeeling, you were involved in the musical plays? How did such chances at the school level help you shape your future? Abhishek: So, after I gave my ICSE, I joined St Joseph's School, Darjeeling (popularly known as North Point) and that was where my singing went up a notch or even more. In school, I was involved in choirs, gospel singing and musical opera. It really shaped me to be the singer that I am today. My skills were honed by two mentors, Mrs Viveca Gurung and Ms Anna Santiago. If it wasn't for them then I don't think that I would have opted for music as a career. IBT: The north-eastern states have a number of talented musicians. What are the obstacles they face in pursuing a career in music? 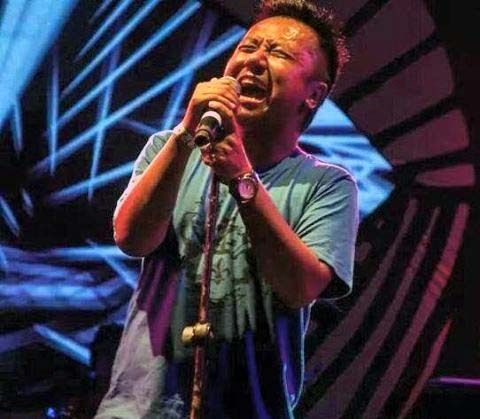 Abhishek: The entire northeast including Darjeeling is known for its musical inclination. We have a lot of talented artists but very limited avenues to perform in. I keep saying this. I don't know whether if you feel it is right, but I think that we are too content with what we do at home and we do not choose to break the chains and come out in the open. I feel the biggest obstacle is ourselves. We must find the motivation to fight our inner demons and then conquer it. IBT: So, you have already received some degree of fame. What are your future plans? Abhishek: (Giggles) Yeah and I'm really moved by the support that I have been receiving. So, the only way to pay back is by making some good music. Both my bands are contemplating on cutting a new album or an EP maybe. So, it'll be coming out real soon. IBT: Among all the songs, you sang on The Stage, which one will you rate as your best performance and why? The Stage season 2 finalist Abhishek Gurung was one of those ever-smiling and shy natured guys (read polite) in the singing competition, but he would turn the table around with his killer performance when his chance came to rock the stage.